Don took the challenge. He began building into his travel schedule opportunities to interview our generation's greatest team builders from the sports and business worlds. During this process, he has conducted more than 100 interviews with some of the most successful teams and organizations in the country. From those interviews, Don has identified 16 habits that drive these high-performing teams. 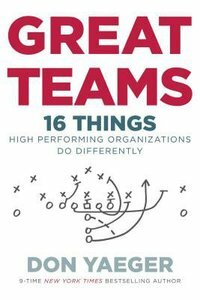 Great Teams Understand the "Why"
Don Yaeger is the coauthor of The New York Times bestselling Under the Tarnished Dome and the critically acclaimed Pros and Cons: The Criminals Who Play in the NFL. He lives in Tallahassee, Florida, with his wife, son, and daughter.